Bollywood has always given a warm welcome to the talent from hill state. After Jugal Kishore, Manohar Singh, Anupam Kher, Preity Zinta, Kangna and Mohit Chauhan now it's Anuj Sharma. Anuj Sharma was born in a small village, ‘Rehan’ of Himachal Pradesh (India) on 6 March 1975. Anuj did his schooling from the village school. He later joined 'Wajir Ram Sing Government College Dehri' as a music student. He participated in various inter college music competitions and even released couple of Himachali music albums. These 'Pahari' albums established him as a folk singer. Anuj did M.A. Music from Guru Nanak Dev University Amritsar, 'Bhaskar in Music' from 'Prachin Kala Kendra' Chandigarh and 'Diploma of Music Recordist' in 'Media Mates' Delhi. All these years he kept on releasing number of Himachali albums. Anuj has sung for first Himachali Feature Film (Fulmu Ranju) produced by Divya Himachal TV as well. Anuj participated in Indian Idol season 2 in the year 2005-06 and was one of the three final contestants. Since then Anuj has been quite busy doing stage shows and Himachali albums. Now Anuj has come up with his first solo Hindi Music Album under the banner of Universal Music. 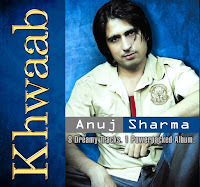 Anuj ha given a try to Rock music in his latest Album Khwaab. Undoubtedly, Khwaab is a result of Anuj's sincere hard work, determination and never-say-die attitude. Days are not far when Anuj will a big name in Bollywood singing Industry. We had an exclusive Interview with Anuj in which he discussed about Khwaab and his future plans. you are so such a fantastic singer. we are proud of your & your work. god bless you. like your album's all song, your voice is very sweet. you have long way to go dear. may god help you. just saw your video, it is too good. Cant believe you had done such a nice work. thanks devbhoomi people for arranging anuj's interview. looking forward for a nice slow track in Himachali/ Kangri .. that just throws the records..
maine "khwaab" ka title song dekha. gana such me bahut acha laga. aap to bahut zabardast lag rehe ho with fultu attitude. woh model se kahi zada sunder aap dikh rehe hain video me. maine aap ka fan club join kia anuj bhaia. hi anuj, i heard yr song.. its beautiful...brilliant composition.. i shud say very sharp and intelligent implementation of drum beats, it fulfills the rock feel in a subtle way..